Three new exploding electronic cigarette cases in California have prompted major lawsuits after multiple people suffered severe burns to the body. GLENDALE, Calif. (KABC) -- Three new exploding electronic cigarette cases in California have prompted major lawsuits against the industry after multiple people suffered severe burns to the body. Attorney Greg Bentley is behind all three cases that occurred within the state in 2015. "Nobody expects that you purchase a product and it explodes in your face," he said. After using an e-cigarette, 23-year-old Vicente Garza, now with a mangled tongue causing him to talk with a lisp, underwent two surgeries on his mouth and index finger. That finger was later amputated at the knuckle. According to case documents, On Oct. 16, Garza was using the device when it exploded in his mouth, causing injuries to his tongue and finger. 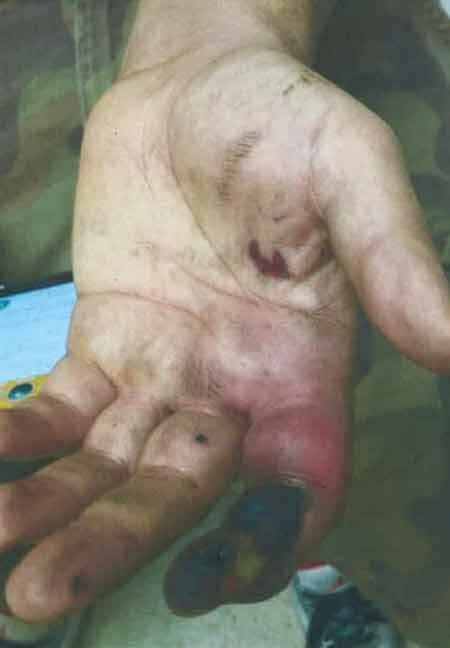 The hand of Vicente Garza on Oct. 16, 2015, with a severe injury to his left index finger after smoking an e-cigarette. "As soon as I pushed the button, it exploded," said Garza. "I was just standing, spitting out blood. I saw my finger and it was black. It had a hole." A second plaintiff, Gregory Phillips, was smoking a similar cigarette on Sept. 11 when the battery of the device exploded in his pocket as he was walking out of an e-cigarette store. The left leg of Greg Phillips on Sept. 11, 2015, with second degree burns. The explosion left him with second degree burns over most of his left leg. The burns were so severe, Phillips spent 11 days in the hospital to undergo two skin grafting surgeries. Within six months of purchasing an e-cigarette, a former member of the Los Angeles Galaxy soccer team, 35-year-old Daniel Califf was attempting to use the device when it exploded in his face. 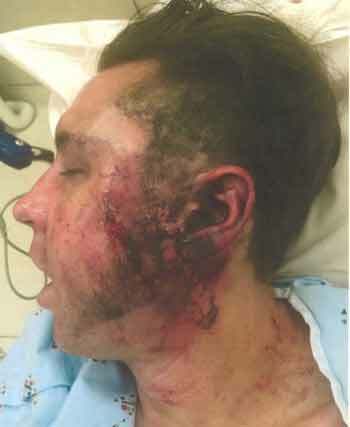 Danny Califf on Feb. 23, 2015, with second degree burns on his face, ear and neck. 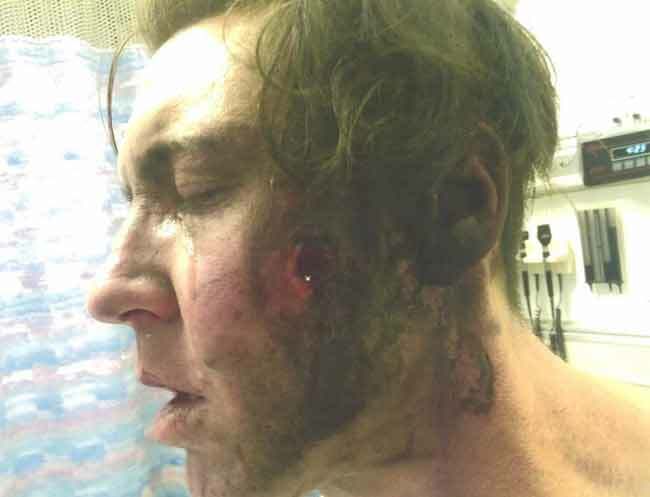 The explosion left a hole in his left cheek and second degree burns across his left face, ear, and neck. He also suffered a broken cheekbone and a concussion, according to case documents. Danny Califf on Feb. 23, 2015, with a fractured cheekbone and hole in his cheek. Bentley hopes to spread the word that people should be outraged that e-cigarettes are ignored by the FDA and are federally unregulated. "It's unconscionable that these products are out there and they're randomly exploding all across the country," he said. He added that about 90 percent of e-cigarettes are made in China, which means if the store where they're bought doesn't have liability insurance, a lawsuit will be fruitless. Eyewitness News reached out to all the companies named in the lawsuits and only four were able to be reached, none of which would comment on the cases.